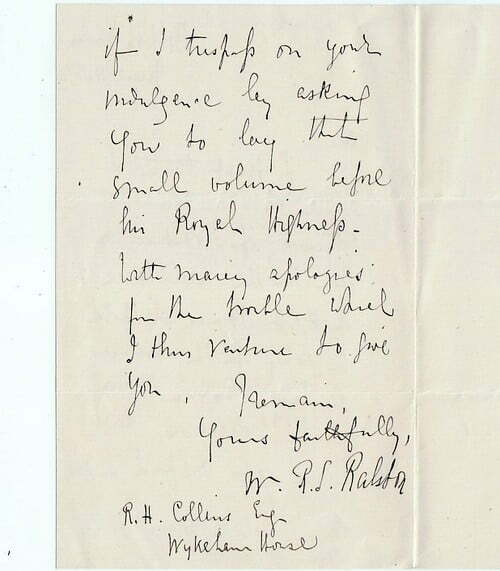 Autograph Letter Signed, to R.H.Collins, Wykeham House, offering “for the acceptance of H.R.H. Prince Leopold a copy of the Lectures on Early Russian History which I delivered last Term at Oxford”. 2 pp. 7 x 4½ inches, in good condition. British Museum, 11 June 1874. William Ralston (1828-1889), Russian scholar, translator of Turgenev.